I have a chocolate problem. Not your typical one week a month chocolate problem. But the real deal. The kind that makes me hide my wrappers in the trash. The kind that makes me eat my chocolate in the bathroom behind locked doors so no one knows that I just downed an entire chocolate bar…at 8 in the morning. Which is probably why, if you read my recipes, the majority of them have chocolate in them. One of my all time favorite chocolate bars is the Chunky. The creamy sweet chocolate wrapped around the crunchy nuts and chewy raisins…mmmmmm….YUM! BUT, my allergy child is not getting anywhere near a Chunky. So what to do? You got it! Create my own! Ahhhhhhhhh…..one of the best parts??? No wrappers to hide! WOO HOO!!! 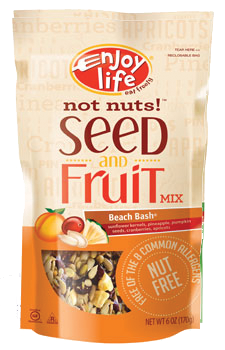 Enjoy Life Seed and Fruit Mix has two flavors; Mountain Mambo and Beach Bash. Both equally delicious, but what wouldn’t be drenched in chocolate??? Contains no dairy, no soy, no egg, no nuts, no gluten, no corn. I love these mixes. Just finished making a batch of granola bars with the mountain mambo. Definitely going to have to give this a try.